Recently we released a new feature that integrates VoIP telephony with Lily. With this integration, you will receive a notification in Lily when a customer calls you. Also, the call is logged automatically in the activity stream for that contact or account that called you. This way, anyone on your team knows when the customer called, who they talked to, and for how long. 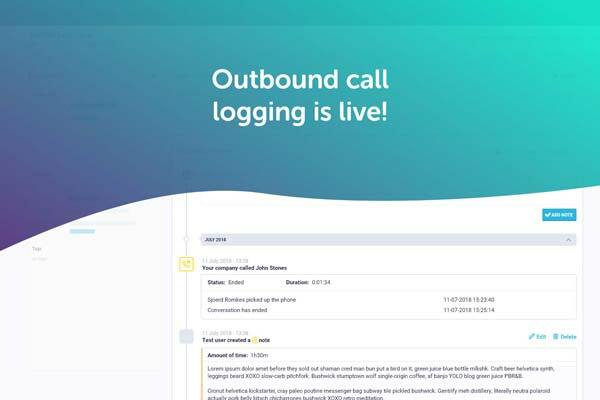 Now we are releasing the second part of this integration – outbound call logging! With this part of the feature, calls you make to a contact or account in your address book are also logged in the activity stream. You don’t need to make a note if you call someone, or remember the 7 times you’ve tried to contact someone before they answered their phone – Lily does it for you! Sounds awesome, right? To make it happen, first make sure your phone integration is up and running. Next, add your internal number (3 or 4 digits) and/or phone number to your Lily profile and that’s it! Calls will automatically be logged in activity streams and you can even add notes to write down what you’ve talked about. Want to know more about Lily’s automatic logging of your calls? Dive deeper into the Help Center article or read our previous blog about call notifications. Send us an email, tweet at us, or chat with us in Lily if you have questions or want to know which VoIP providers we currently integrate with. Happy calling! 3 thoughts on "You do the calling, Lily will do even more"
How i can download your software? Hi! As Lily is available as software as a service, it is accessible in every browser and . Ofcourse our code is open source, which you can find on https://github.com/HelloLily/hellolily. I’d suggest you click on the ‘Try Lily for free’ and register to use the software. If you have any questions, you could always start chatting by clicking the chat bubble in the bottom-right or email us on info@hellolily.com.